I suppose I was disappointed that Tobey Maguire backed out of continuing the Spiderman series, but... not so much. That Iron Man surprised and presented a much more engaging le ad character was partly to blame. But as the series progressed, or ended, I didn’t like the character anymore or Maguire’s portrayal of him. Kind of a whiney snot. So, what’s Hollywood to do when there’s a vault of cash waiting to be gathered from the existing or new generation of Spidey fans? Reboot. Certainly that worked to a degree for Hulk, but the first Spiderman, by my estimation, was a pretty fantastic visual adaptation of a superhero that I grew up with, with ample bonus points for remaining mostly true to Marvel’s origin story. Casting aside (other than J. Jonah Jameson), they did everything right. The new Peter Parker – it’s all about the tousled hair. He’s presented as more scientifically intelligent than the first movie, and that’s actually truer to the comic. He’s darker and a bit cooler than Maguire. But, and it’s a very bothersome “but,” whenever he has to strike a pose... it’s the hair (at least it’s not Bieber hair). Webs - I liked the first version in that, if bitten by a radioactive spider, it makes sense that one might have a biological mutation to shoot organic webbing (it’s no more nonsensical than any of his other powers). However, comic fans know that half of Spidey’s combat troubles were running dry on web cartridges in his web-shooters. 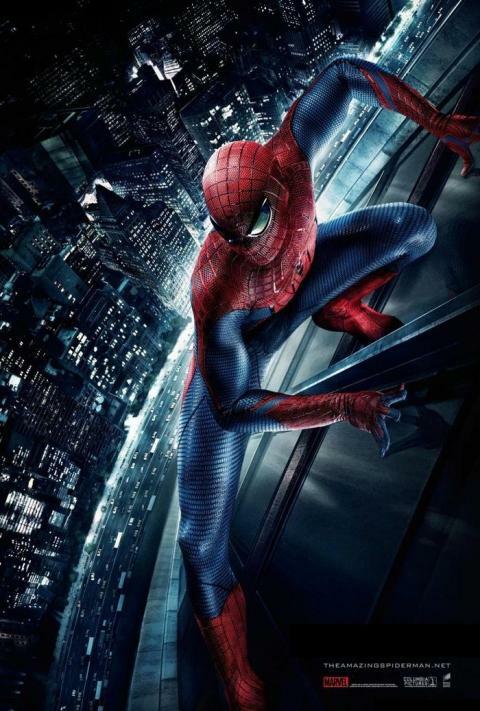 This version returned to the auxiliary equipment, which I liked, but never followed through with the problems of “Uh oh, I’m falling from a skyscraper and I’m out of webs.” Such stuff matters to fans and would have greatly helped well shot but predictable action scenes. NYC – Is obviously doing much better economically than the rest of Capitalistic world. How else would tower cranes be available at every block for our hero to swing his way quite a distance to the final showdown? Sheesh. One or two cranes? Cool. Twenty? Get a new writer. Thugs – Okay, he attacks one, and suddenly there’s a gang of them. First, Spidey could beat them all, no contest. But instead, he runs away. Sort of. He runs, jumps, leaps off of walls, climbs, and... Hey, those thugs sure caught up to the roof level pretty fast, like they took the elevator and knew where he was going all along. Bad. Just bad. Plot devices made simple - Needed: Radioactive spider, intro to villain, and reinsertion of potential love interest. Gosh, I think we can do that in one sequence! Let’s see how shrewdly this was constructed. Pain – this Spidey takes more of a beating than those in the past, such as getting pounded repeatedly through walls and against hard floors. A flaw observed in every superhero movie (or comic), the physics is as painful as the injuries. Experienced jet pilots would have difficulty with the g-forces involved, never mind the inertial halts. But, at least explain to the audience that poor Spidey also has inherited incredible durability and recuperative powers. It’s all assumed as if, well, people watched the other movies. Bad guy – there has to be one, and finding one is a challenge in the post-Joker world (Heath Ledger version). So we get a almost a re-run in our reboot. Dr. Curt Connors (a nice, engaging scientist who may as well have been Dr. Octavius) who because of certain pressures makes a bad choice, becomes a Lizard (with better CGI even than the recent Hulk), and has this “great idea” borrowed from the nefarious League of Shadows in the first Christian Bale Batman flick to (*yawn*) disperse a chemical agent in the big city that would cause all sorts of problems. Next screenwriter, please. Alternate bad-guy. Flash? Really, a bully named Flash? Stan Lee, less cameos, more involvement! You wrote better than this in your sleep! Ouch. So, other than the web-shooters, what else was there to like? Gwen Stacy - Sorry, but Kirsten Dunst’s needy Mary Jane bored me, even though she played well against Maguire’s version of Spidey. Not one prone to such sentiments, Norman Osborne’s comment to his son Harry was still appropriate, something akin to “use her and lose her.” She shouldn’t have made it past the first movie. Here, though, Gwen Stacy has a strength about the character – intelligent and capable – that deserves Parker’s interest. Casting - Despite the hair, Andrew Garfield portrays Spidey much better than Toby Maguire – meaning truer to the original comic... like Gwen Stacy, more intelligent and capable, with an edginess about him. That said, Maguire’s joys of entering Spidey powers were much better depicted, but that’s a scripting issue. Yet another one. All around, the supporting cast is improved. Another benefit is that James Franco (Green Goblin, Jr.) is nowhere to be found. Perhaps he’s off studying at the Keanu Reeves Acting School for the Bland. The new Spiderman – Computer generated graphics are presented at the expected high level, but it’s so common now that a “wow” factor seems impossible. That’s not a fault of the movie. Fans of the comics may be pleased that action-Spidey adapts more poses as seen within the comic pages, usually oddly angled. In fluid movement, it still works, highlighting the “insect” nature of being a Spiderman. Spidey humor – “Ahem, you know, if you’re going to steal cars, don’t dress like a car thief.” Bad guy: “You a cop?” Spidey – “Really? A guy’s sitting in the back seat in red and blue spandex and you think he’s a cop?” - the type of humor that fans expected in every issue. Overall, I liked this movie. It’s just unfortunate that a reboot is necessary after only 10 years since the original. I prefer the original slightly, due to a much better script (Parker’s financial woes being a part of it) and the initial awe of CGI bringing life to comic pages. Still, it remains a story of which I’m very fond, and the lack of writers’ imagination aside, it’s an enjoyable movie. I suspect that most Spidey fans will feel the same – it doesn’t matter which version wins. The pay-off comes with the next Chapter, and we’ll see what hopefully some better writers can do with the improved cast.